Training | Ready. Set. Plan Your Event! 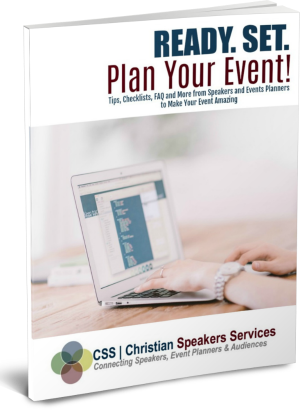 Tips, Checklists, FAQs and More from Speakers and Event Planners to Make Your Event Amazing! ​"I have used Christian Speakers Services a lot over the past 10 years for our church's quarterly Girls' Night Out and have been extremely happy with their service. Christian Speaker Services is very easy to work with. The CSS staff has been very efficient and is always available to assist. They are awesome to work with. Very professional and prompt. They have made my job as coordinator much easier when it's time to book more speakers!"